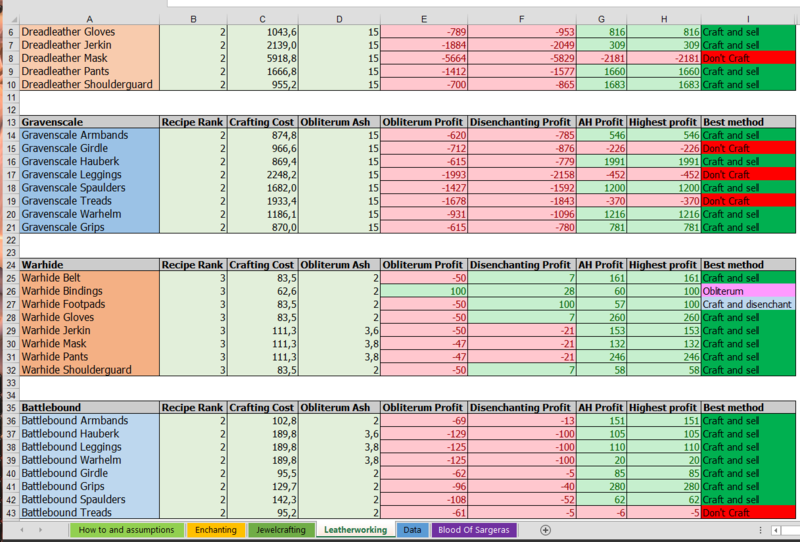 I just finished adding Legion tailoring to my spreadsheet. The design and functionality of the Tailoring sheet is exactly the same as for the leatherworking sheet and you can find the instructions for that in my post here. In addition to adding Tailoring I have updated the obliterum yields from leatherworking and tailoring as both of those seems to have been wrong. They will still likely not be profitable so you are better off shuffling leather and cloth into enchanting materials and then crafting enchants to obliterate if you want to sell obliterum. The updated yields are from Sterling over at the stormspire forums. A lot of people have had issues with the Google Sheets version running out of API calls. From what I can tell now the Importdata() function used to download the pricing data will automatically update once an hour. So if you leave your TSM API key in for 10 hours it will use up all of your requests. I strongly suggest removing the TSM API key from the cell and keeping it in one of the other cells on the Inputs sheet and then just copying it in when you want to download data and check prices. Remember to delete it from the B1-Cell when you’re finished with the spreadsheet so it does not keep requesting data in the background. Hopefully this will help you avoid getting locked out. For all the armor pieces you can see the value of selling them straight up, disenchanting and selling materials or obliterating the pieces. The best method is highlighted and shown in the rightmost column, as shown in the screenshot below (It’s from the leatherworking sheet, but the tailoring sheet looks exactly the same). You can see that it automatically colors the Best method cell so you can easily see whether an item is worthwhile and what you should do with it. The set-up for calculations is the same as for leather working with two hidden sheets, one for material prices and one for the recipes. The main shuffle for tailoring is turning mass amount of Shal’dorei Silk into bracers with the rank 3 recipe and then disenchanting them. For disenchanting I am assuming a 1.5 % chance of a chaos crystal per craft. This is a combination of the 15 % chance of proccing a legendary and then a 10% chance of getting a chaos crystal from disenchanting the Legendary. The disenchant value takes the maximum of 1 leylight shard or 3 arkhana for rares. I have included the value of Blood of Sargeras in the disenchant calculations, at a 5% Blood of Sargeras rate. This is the consensus rate for Blood of Sargeras and is in line with my results. On my realm at least I have also noticed that the 815 gear seems to be profitable to craft even at recipe rank 2. This is consistent with what I have found in the Legion Leatherworking markets so I will definetly be setting up a TSM group and start crafting Imbued Silkweave gear. Hopefully I will get out a post on this on Thursday or Friday as long as I have some results to show. First of all, youre a genius! Thank you for that marvelous sheet! So, I dont know why exactly, but I’ve downloaded the sheet yesterday, and it was worked wonderfully. However, today when I open up it again, all the values were like #N/D. I’ve thought that I should run the macro again, and I’ve done that, but still so, all values keeps like #N/D. The data was being imported, but giving a look at Data table, Ive noticed that a huge amount of itens was missing, that is right the itens on the other tabs, like gems, leathers and other meterials… so, I would like to know if it is only happening to me, and if there is anything I can do to solve it. What sort of error messages/problems are you getting? I think I answered you on the discord server. You had an issue with only downloading some of the data. That must be an issue with the API that I sadly cant control. I suggest trying again today and seeing how it works. is there anyway to make the importdata function not run once the api key is removed so that the data tab keeps all of the data instead of clearing to blank?